Mary Ann Flunder is proud of the role she has played in helping to send thousands of youth and adults to college. As a 22-year member of the Kansas City Kansas Community College Board of Trustees, she has been instrumental in recruiting both traditional and non-traditional students and providing them with the resources they need to enroll. This is just one of the more than 50 local, state and national organizations she has served over the years. Others include KCK Northeast Optimists, Kansas Association of Community Colleges and the National Association of Community College Trustees. She has served as president of the Kansas Federation of Democratic Women, and speaker pro tem of the Kansas Silver-Haired Legislature. Flunder has spent most of her career in the same way – working for organizations that serve the community. 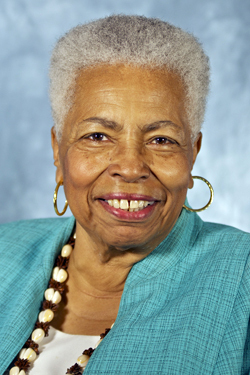 She served as the executive director of Turner House from 1973-75, and started two important programs while she was there: a nutrition site for senior citizens, and Karamu House, the first “school drop out center.” She was the first director of the office of minority affairs at the University of Kansas from 1985 to 1992. She spent 20 years at the Economic Opportunity Foundation, where her work allowed her to be a resource for families and children. And she and her family owned and managed Flunder’s Groceries for 30 years. She is grateful for the community support she felt as a student growing up in Kansas City, Kansas. She said that along with her parents, her teachers, church family and neighbors helped nurture and raise her, and gave her many reasons to believe in herself. She has received numerous awards over the years including the NAACP Humanitarian Award, the Merit Award from Turner House and the National McCarthy Award from the Optimists. Her advice for today’s students is: follow your interests, no matter what they are, because it’s easy going to work when you like what you do.